Happy First Official Day of Fall! Granted I have had my house decorated for Fall since Sept. 1st but now it is official! I. Love. Fall. Cool weather, crisp morning air, changing leaves.... it is my favorite. I was so excited this fall because I finally have a house of my own to decorate with pumpkins and leaves and all things fall! My hubby was a little overwhelmed with my explosion of fall decorations as of Sept. 1st (I couldn't wait) but he is dealing with it. 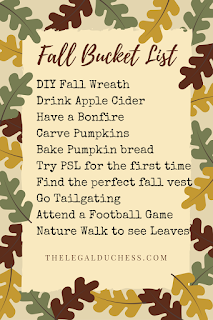 As this is the first fall we are spending in a new city, I decided to create a bucket list to accomplish to help us make the most of this wonderful season. I love a good DIY and I also love wreaths. Lets see if I can make it happen! Though it has to be hot, I love some good, homemade apple cider. Finding it will be an adventure in the new city but I know it will be worth it to taste that sweet, crisp cider. We finally have a firepit in our backyard and I am itching to test it out! I want to have a little get together with some friends and get a warm, crackling fire going because that is just what fall dreams are made of. I have not done this is years and I am feeling nostalgic. I can't wait to have two carved Jack-O-Lanterns on our front porch! This just sounds heavenly and I want it in my kitchen right now. I know, I have lived a sheltered life. Until my new city, I have not had a Starbucks within 40 miles of my home so this will be a new experience for me. I love all things pumpkin so I am sure it will be a hit. Now that I go to a University that is not minuscule, my Hubby and I are wanting to go tailgating. We have plans for the homecoming football game; should be a fun time! Going with my last item, after tailgating, we must go to the football game. I have only been to one other live football game and I have never been to a college game so it should be really fun. Oh how I love fall leaves! I can't wait to find a lovely park in our new town and explore the woods and get my fill of colorful fall leaves! 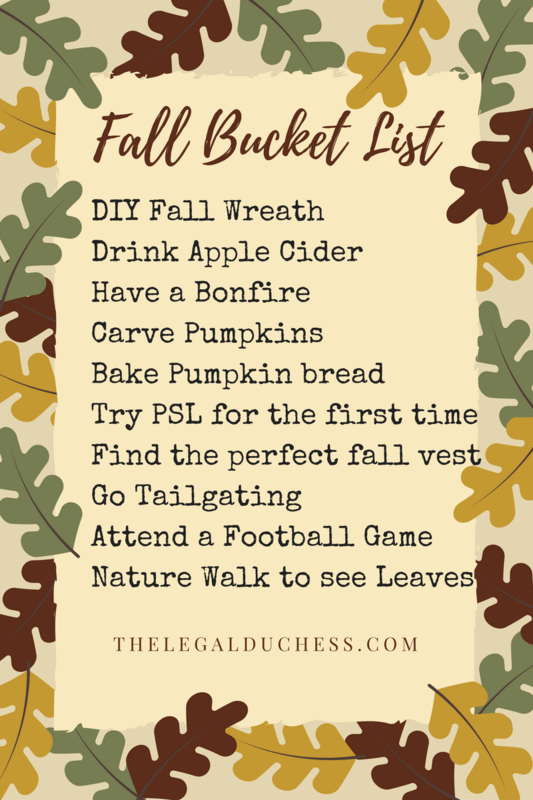 What is on your bucket list this Fall?